iPhone 5 finally gets officially unveiled on September.12th. With the 4-inch display, a new16:9 aspect ratio, HD resolution and blazing fast A 6 processor, iPhone 5 would be a nice choice for Apple fans to watch videos. As we all know, iPhone 5 only supports offline playing MP4, H.264 and Motion JPEG videos with specific audio and video parameters, including bit rate, video resolution, frame rate, video codec and audio codec etc. Therefore, not all MP4 files are playable on the new iPhone 5. How Do I Convert MP4 to iPhone 5 on Mac? 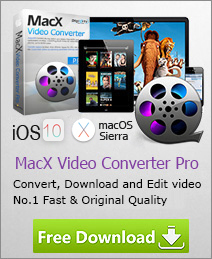 MacX Video Converter Pro works perfectly to convert MP4 to the new iPhone 5 supported video file easily. Built in 320+ video and 50+ audio codecs codecs and advanced video decoding engine, this program offers a reliable, simple and fast way to transcode MP4 H264/MPEG-4/HEVC to iPhone 5/5s/6/6s/7/8/X in fastest speed, due to its hardware acceleration tech which helps to increase the conversion speed to up to 5x faster than other tools. This feature-rich software also supports converting a wide range of other HD and SD video and seamlessly transfer video to iPhone 5, iPhone 4S, the new iPad 2, iPad, iPod, PSP etc. For example, decode MKV to iPhone, convert M2TS, AVCHD, FLV, AVI, MPEG, H.264, MOV to all generations of iPhone, iPad, smart phone and so on. Fastest Mac video transcoder to easily convert MP4 videos in UHD/HD/SD for iPhone 5/5S (iPhone Xs/X/8/7/6s/6, etc), up to 5X faster than others. First free download this video to iPhone converter and install the program is simple and costs only few minutes. PC users can also get the Windows (10) version. Just follow the guide to know how to decode and import MP4 to the new iPhone 5. Click "Add File" button, browse and select the MP4 video. Batch conversion is also supported, so you can load several video files at one time if necessary. In the output area, choose "to iPhone" as output format then select one of the preset profile for the new iPhone 5 to convert MP4 to iPhone 5 on Mac. Specify output folder on your computer to save the output files. Click the "Browse" button to select a folder where you want to store your output MP4 files. Click "RUN" button to start converting your video file. Meanwhile, you can view the conversion progress and are able to cancel the converting process at anytime. When the conversion is done, you are free to import the converted video to iTunes library, transfer the video to iPhone 5 for smooth playback right away. For Windows users, this software also has a PC version available.